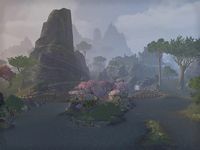 The Isle of Contemplation is a small island in northern Auridon, just northwest of the town of Dawnbreak. A chapter of the book, Auridon Explored, can be found on this small island next to a bench. This page was last modified on 19 November 2018, at 05:11.